Here’s my updated Crop Planning slideshow, which I presented last weekend at the Virginia Association for Biological Farming Conference. To view it full screen, click the diagonal arrow in the lower right. I will upload my other presentations bit by bit. January and early February are choc-a-bloc with conferences and slideshows, so there will be plenty to see in the next couple of months! 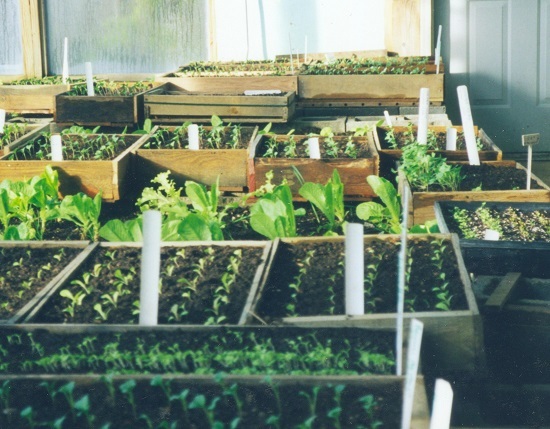 Seed flats in the greenhouse in early spring. Spring starts in January in Virginia! On January 17 we make our first sowings in the greenhouse. We sow some early cabbage, the first lettuce, and some scallions. The week after that we sow our hoophouse tomatoes! Ah! Signs of spring! Even if we did manufacture them, so to speak! Our germinator cabinet is made from a broken fridge, warmed by an incandescent light-bulb. We’ve got maybe one more year before we run out of incandescent light-bulbs. Then we’ll have to get a different form of heating. But we’re shelving that problem for now. We check twice a day to make sure the light-bulb is still working and the temperature in the germination chamber is still OK.
By the end of February, we’ll have sown tomatoes and peppers for growing in our hoophouse, and spinach, kale, collards, cabbage, lettuce, scallions, broccoli and senposai for planting outdoors. When the cabbages emerge, we’ll need to make space for the flat in the greenhouse near the window. When the hoophouse tomatoes have germinated, they will go in a plastic tent on a seed heating mat by the greenhouse windows. We have the 48″ x 20″ size mat, and we extend the plastic tent and graduate the older seedlings off the mat, but still under the tent for extra protection. Screening compost to fill our greenhouse beds in September. 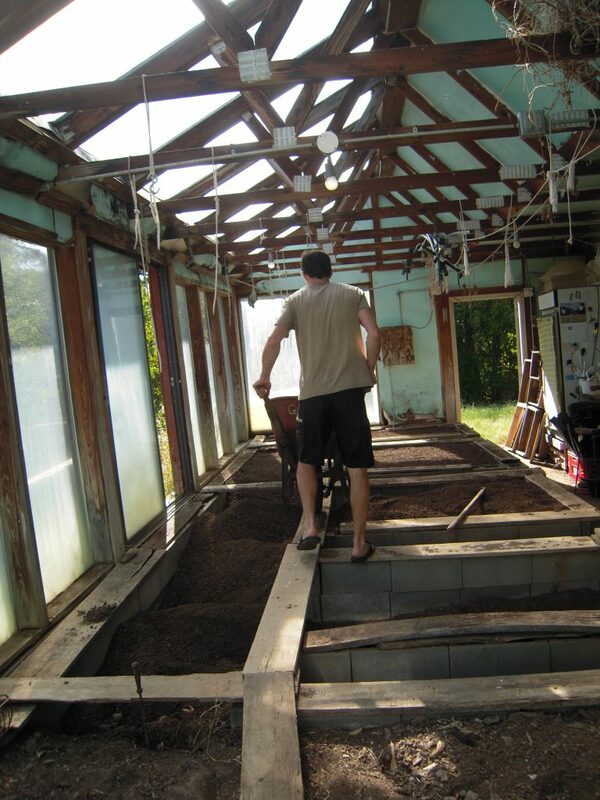 Our system for seed compost is to screen a big pile of our homemade compost in September, and fill the cinder-block beds in the greenhouse. Then we pop lettuce transplants at 10″ spacing into the beds. Those lettuces give us salad from November to February. As we need space in the greenhouse, we pull the lettuce. 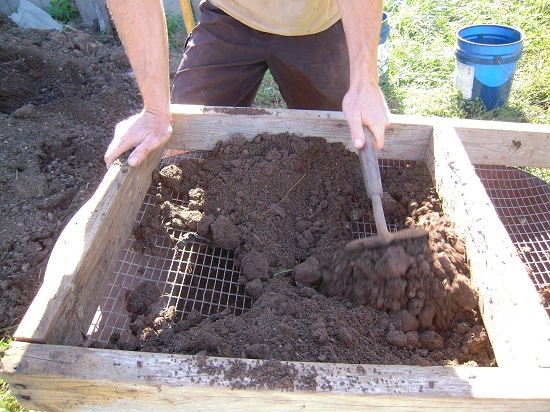 We can then scoop out the compost to fill the flats for seedlings. This system works well time-wise –we benefit from this lettuce supply in the winter. It also works well in providing us with a large quantity of mellow screened compost for seed flats, indoors and not frozen. The soil organisms have had time to colonize the compost, so it is full of life. 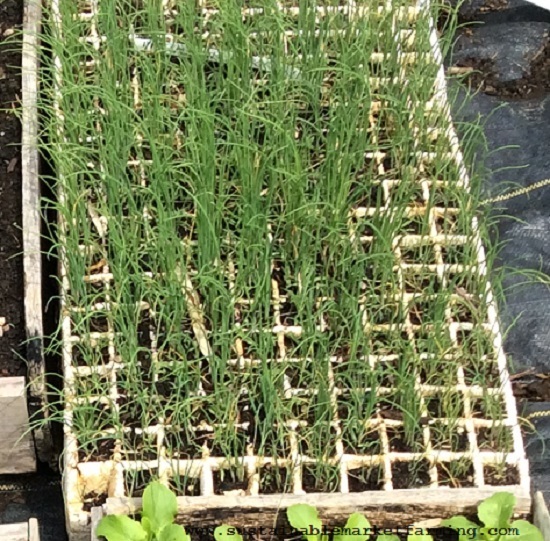 As the seedlings grow, we spot them out into bigger flats, with about 2.5″ between plants. My favorite tool for this job is a butter knife! For lettuce we use 3″ deep flats, but for most crops we use 4″ deep flats, so the roots have plenty of space. We use a dibble board to make the evenly spaced holes in the compost in the bigger flats, to move the tiny seedlings into. It’s a piece of plywood with fat dowel pegs glued into holes at the right spacing, 40 in a 12″ x 24″ flat. On the other side of the board are two small wood handles to make it easy to use. A flat of scallions to transplant in April. There is a great website on Vegetable Transplant Production from the University of Florida Vegetable horticulture Program. It has a collection of excellent articles developed by Charles Vavrina in the late nineties. Plants still grow the same way! Check out the site for lots of useful tips about growing and using transplants. This is a good time of year to make plans to do something in a different way, to avoid repeating last year’s less successful episodes! You can see our Twin Oaks Month-by-month Garden Task List here on my website. Newbie flower farmer here, I’m using a a small sized crock pot in my converted deep freeze germination chamber. It is set on low and connected to a $35 inkbird thermostat that hombrew beer makers use. Let’s me set temp to 71 for cool season annuals and then higher for warm season. Kicks on power to the crockpot whewhen needed and the ceramic bowl in the crock pot holding a couple cups of water stays warm in between cycles so I i little temp variance. Thanks for this tip, Kathy. It reminds me about the equipment Ben Hartman writes about in the Lean Farm – he uses a metal tray of water with an immersion heater of some sort in it, as far as I remember. Yours is a smaller scale version of the same idea of heating water to provide damp heat for germinating seeds.